One of my mamma’s all time favorite treats has been, and will always be a fifty-fifty bar, or as some of you might know it as an orange creamsicle. It’s basically a vanilla ice cream popsicle center with an orange ice cream covering it. Hence a 50/50 popsicle. My sisters and I had them a lot as kids because my mom loves them so much. She’d buy them all the time with the guise that they were for us kids, but now as an adult I’m convinced that she mainly bought them for herself. You can’t blame her for that, especially because we know that kids will literally eat anything ice cream/dessert related. No questions asked. Anyhow, I digress. You’re not here for my childhood musings. These No-Bake Orange Creamsicle Bars are just like those popsicles my mamma loves so much. They’re chilled and perfect for summer because guess what? You don’t have to turn on the oven and heat up the house. You can still have an ice cold treat without all of the work. 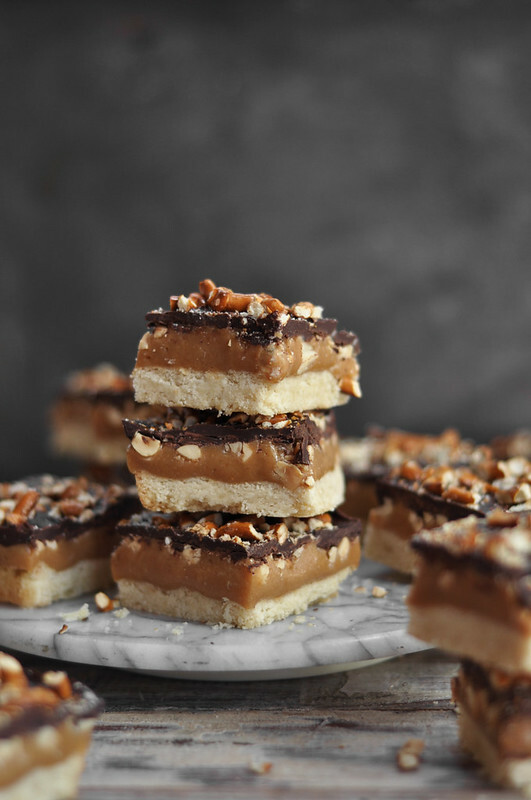 These bars are part of my monthly collaboration with Go Bold With Butter. 100% real dairy butter and 100% percent tasty. Always. I don’t have to tell you this though. You already know how amazing butter is. This isn’t news to you. These bars, however, are definite Cheers to the Weekend vibes, and don’t you forget it. Crisp. Windy. Cold. You walk around the city, in the chilly breeze. Teeth chattering. Nose running. Anxiously looking for any sign of relief from the blizzard that is outside. You start to speed up your pace, with no destination in mind, hoping that this sudden spurge of fast movement will get you warmer, you walk and walk. Your mind is traveling at a hundred miles a minute and you can’t seem to concentrate on the rest of your day or the tasks that lie ahead. You need a break from the freezing temperatures. Perhaps a hot cocoa, and a tasty treat from a cozy and warm coffee shop is just what the doctor ordered. You look around for any friendly coffee shop, cafe or bistro. Suddenly you spot it, the coziest of coziest coffee shops. A small ma’ and pa’ shop, typically found in movies. Your heart jumps and your feet seem to travel faster than the rest of your body, which can’t catch up. You reach for the freezing handle and give it a pull. It wont budge. You keep pulling with all your might, but nothing. You desperately curse the air and the cold. Then out of the corner of your eye, you notice the tiny sign on the door, “Push.” You laugh to yourself and quickly look around to see if anyone has noticed your silly mistake. You give it a gentle push, as if you knew all along, and are instantly taken aback by the warmth and aroma of all things heavenly inside. You walk in. You look at the board and scan it rather intently, although you are already fully aware of what you’re going to order. You wait in line as a little old lady gives the cashier the “exact” change in pennies, nickels and dimes. The next customer is asking what’s in everything, and you can’t seem to get there fast enough. Finally your turn arrives and you ask for their large, boat-sized, hot cocoa. “Whip cream?” the barista asks you with the friendliest of smiles. “Sure, why not?” you respond. Looking at the case full of home-made goodies, you ask what is good. 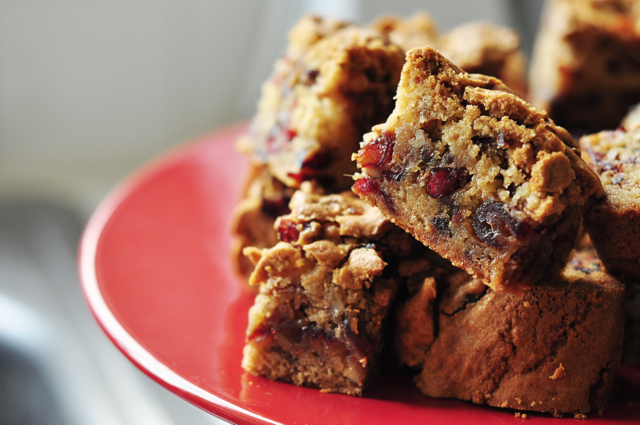 “You have to try our cranberry pecan date bars! They’re the customer favorite.” You contemplate this choice to yourself. Now you’re the one holding up the line. But who cares? You think, “Hmmm, cranberry pecan date bars. Huh? Interesting.” You make up your mind on the spot, and yell out, “Okay, I’ll give it a try!” Just then you realize that you’re screaming for no reason in particular. He hands you your bar and you grab your hot cocoa, douse it with cinnamon and find a comfy couch by the fire. You take a sip of your cocoa, and it hits the spot. Warming up the rest of your body, instantly. You take a moment and stare at the bar, inspecting it. You take your first bite. Suddenly, your whole world is spinning, you wonder just what’s in this bar of yours. Of course, nothing other than dates, pecans and cranberries. You finish the whole thing, and don’t even realize you have. You get up and order another, he already had one waiting for you. “Happens all the time.” You smile, and sit back down. This time enjoying and savoring every bite, not wanting it to finish. You bundle up and brave the cold air once again, only this time you don’t realize just how cold it is. You walk and walk, yourself back home, not fully conscious. You get to your house, although you have no idea how you just got there, what streets you turned on or if you’ve followed any of the pedestrian signals. For the rest of the day, and week for that matter, you can’t seem to get those delicious bars out of your mind. You crave them in your sleep, dreaming about their deliciousness. Finally, you come to the realization that the only way you can continue to live your life, is to make them yourself. Hope fills your body with the sense of excitement. But you think aloud, “Where do I begin? I don’t even know how to make them!” Well look no further, my worried friend, because I’m here to help you. Put your faith in uncle Jon, because he’s got your back. As autumn continues to unfold, it brings with it, the cool crisp air that just screams out “Bake Something! 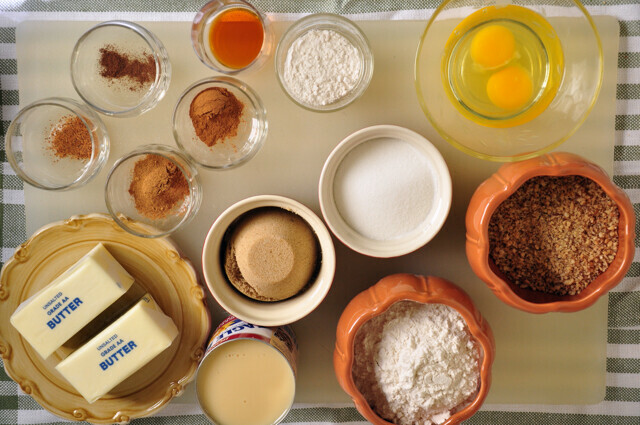 Bake Something!” The temperatures start to drop and the sudden urge to warm up the house with cozy home baked goodness and wonderful smells, suddenly starts to rise. Now that summer has finally left, the chill autumn air excites. You find yourself needing blankets in the middle of the night. Sweaters and jackets when you leave the house. Turning on the oven more and more, as an excuse to heat up the place. Of course if you live in Southern California, you know that this isn’t the case. With temperatures reaching nearly hundred in the middle of October, we can’t help but wonder, “Has summer really left us?” For us Californians, we still have those sweaters hanging in the closet and the ovens turned off for the greater part of the week. But if you’re lucky enough to get those brief autumn moments California throws at us, then you know you must enjoy it to the fullest. Now, if you’re somewhere in the East Coast and the leaves have turned color, the weather has dramatically changed to the perfect crispiness, and bushels and bushels of apples are raining down from the trees, well then….don’t tell me about it. Because I don’t care one bit about those things. I like being barbecued in the sunny Cali heat. I like feeling like its Summer 2.0 all over again. So there. Regardless of whatever the weather likes to indicate, it is autumn, and it is in full swing. There’s something about autumn that just transforms the mood of everyone. 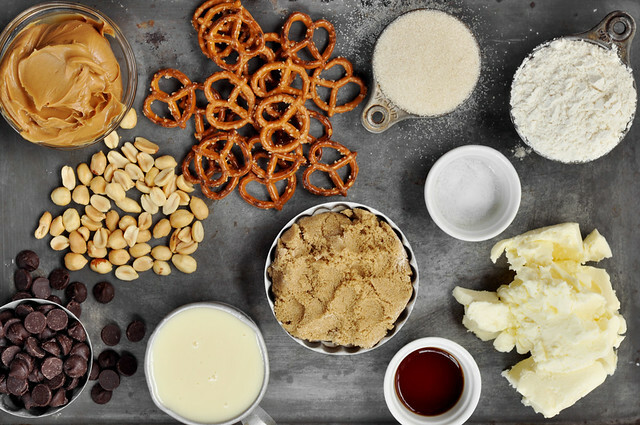 It’s the beginning of the best cooking and baking season. Halloween, Thanksgiving, and well into winter and Christmas. Its the one time you can cook and cook and eat and eat without feeling guilty because we tell ourselves “Oh its the holidays. I don’t eat like this all the time!” We automatically start to feel a hundred million times better. But it isn’t just the cooking and good food; autumn has the power, filled with the magical ability, to bring people together. Or maybe its just the holidays that does that. Anyhow, it does, however, have the power to produce pumpkins. And as we all know pumpkins are the main stars of fall. This wonderfully sweet and diverse vegetable finds its way in all kinds of recipes during this season. 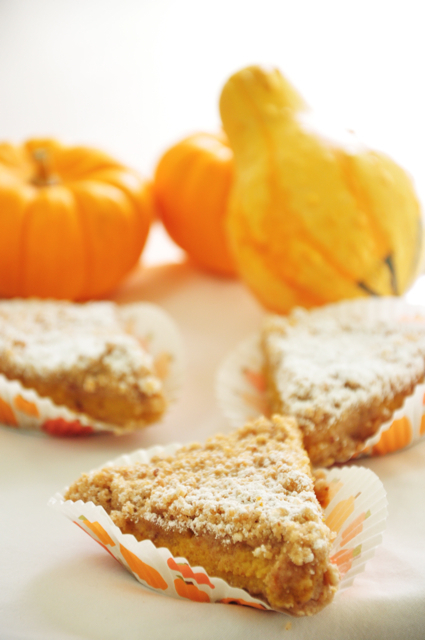 Pumpkin pie bars are the perfect treat if you want all the great taste of pumpkin pie, but on the go.